I didn't expedite my new catalog order because I was still involved in shenanigans with my out-of-town retreat guests on the days an expedited order would have arrived, so I think that's the first time in my 16 years as a demonstrator that I didn't get my new goodies next-day air. However, after everyone left, I had a day or two to prepare my shelves and make stamp pockets for my new stamps, print labels for all the stamps and dies and be - wait for it - ORGANIZED when the order got here. So now all the things are labeled, and happily in alphabetical order in their spots, and that's when I feel most creative is when I'm organized and can put my hands on what I need. One of the shenanigans we did was so fun - it was the Austin Panic Room - I think this will have to become a post-retreat tradition. If you have one of these near you - what are you waiting for? I did one in Cincinnati too that was so much fun. So after my friends left - sniff - and I got organized, I finally had time to play - and I decided to go big (literally) or go home. Except I was already at home, so that part doesn't really compute, but whatever - stop overthinking my blog post! My friend Iliana (My Sweet Petunia) did a product swap with my OTHER friend Sally Lynn MacDonald who works with Gel Press, and was nice enough to send me the new Gel Press Impressables, because she knows I'm a gel monoprint FIEND. A FIEND, I tell you! What is super duper extra cool about both the Impressables and their regular gel presses is that you can use them just like stamps in your MISTI. BUT - if you have a Memory MISTI - you get two bonus workspaces - the lid of the MISTI, which the presses stick to - the base of the MISTI for another press, AND if you use a Gel Press for your paint plate, you get not only a paint plate, BUT a bonus printing plate! At one point, I had SIX plates working just between the Memory MISTI and the side paint plate - three of the Petites, two Impressibles, and the 5x7 plate. This will make more sense when you see the video - but anyone who has gel printed before will immediately understand this is a HUGE space saver AND multiplies the number of prints you get with a single application of paint. I feel like a smartypants, I'm not gonna lie. The hugest hit of my retreat was a technique we did that served as a backdrop for the sweet girl from the Birthday Delivery stamp set. 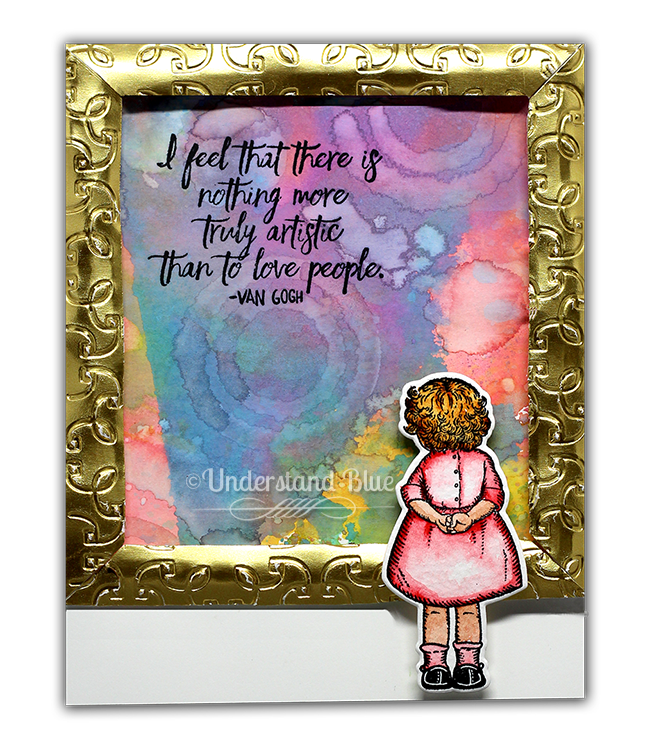 My friend Yoorah and my friend Pam did such adorable cards with her throughout the weekend, and my favorites were where she was looking at a piece of art. I decided to make that the focus of my Gel Press cards, so here's what I came up with. After a weekend with these lovely ladies, the sentiment was perfect. If you don't love this sweet, wistful image from this set, you are a danger to yourself and others. Please turn yourself in somewhere. She just squeezes my heart. To make the frame - I cut the pieces from gold foil sheets, and rolled them around a pencil to make them rounded. Then I put a dimensional + a mini dimensional (stacked) on the back to attach it to the card without it getting flattened. (The mini dimensionals in the new catalog are one of my favorite products!) The gold strips are embossed with the Garden Trellis Embossing Folder. So I have a video on the whole process for you - I can't tell you how much fun this is. You'll just have to see for yourselves! Now before I go, I have to share a few fun things I've come across in the last few weeks. I was supposed to go to Diana Gibbs' retreat, but couldn't go because I had to work. So she boxed up all the gifts and projects and instructions and sent them to me, like the sweet girl she is, and she included what has become an OBSESSION for me - my new favorite pen! I LOVE this pen so freaking much I went and bought it in ALL THE COLORS. I am a complete pen snob, and these are amazing. RUN, don't walk, to get these. The turquoise is my favorite. I bought everyone the new planner from Stampin' Up! for my team retreat gift. It's SOOOOO pretty! And if you want to add custom pages to it - you need this ingenious plastic punch - I like to add graph paper to mine for lists and zentangling. And finally, I think I'm the last person to read (listen to) this book, which I loved. For some reason, I had it in my head that it was some sappy story (I'm not into sappy) - but it's not at all. It's wonderful. And speaking of Van Gogh - I'm also listening to this, which is fascinating! So incredible to hear all his frank thoughts he spelled out in his many letters. I hope you have a colorful week! I'd love to hear any favorite books or recipes you're trying right now. I have a few months at home before my next trip so I'll be devouring audiobooks. I simply adore this beyond words! Now off to click on all the various links to buy the audible book, the pens, and the sentiment set! WOWWW! I am so behind the times with my one original Gel press!! GAH!! Looks like fun, beautiful creations. OMG I don't have a gel plate but you JUST fired up an idea!!!!!! HOLY CRAP I AM EXCITED!!!!! LUHVE the card!!! If you like pens, have you checked out the Pilot G3 Fixions? They are gel pens that are erasable and refillable. They are amazing! I big puffy heart them and they erase really good. Here is a couple of links, I prefer the 0.7mm thickness: https://www.amazon.com/Pilot-Retractable-Erasable-Assorted-31472/dp/B009QYH644/ref=sr_1_fkmr1_2?ie=UTF8&qid=1497665036&sr=8-2-fkmr1&keywords=pilot+g3+frixion+0.7mm. But they also come in 0.5mm: https://www.amazon.com/dp/B00CWX3JTC/_encoding=UTF8?coliid=I22DV67OKO4D35&colid=B163WKBWQKO6. So cool!!! All of your examples on the video are fabulous! I still haven't made time to use my geli plate and I have had it for several years now. :( The Impressionables look like they add fabulous dimension without having to search the house for an item to stamp in the paint! Your card is too fabulous for words! thanks so much for a great video. I am soooo happy that you are like me and don't mind getting your hands dirty. I hadn't heard of these before and I love you idea of using the Misti with them...can't live without my trusty MISTI!! !